Rappelling and down climbing are both means of descending; the choice is based on mission, situation, equipment, terrain (available anchors), weather, number of troops involved, and time and equipment available. 2. Selecting a Rappel Point. The technique of rappelling involves the quick descent of a climber and the retrieval of the rope from the bottom. 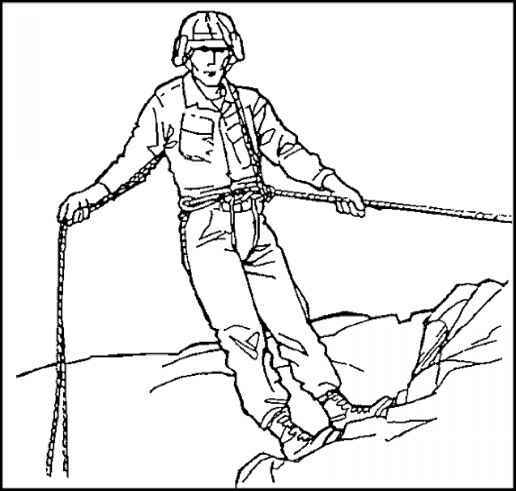 The selection of the rappel point depends on factors such as mission, cover, route, anchor points, and edge composition (loose or jagged rocks). The anchor point should be above the rappeller's departure point. It is best to use primary and secondary anchor points (natural anchors are preferred). As a climber, you should make sure that the rope reaches the bottom or a place from which you can further rappel or climb. The rappel point must be tested and inspected to ensure the rope will run freely and that the rope will run freely and that the area is cleared of obstacles that could be pulled off. If a sling or runner is used for a rappel point, it should be tied twice to form two separate loops. Make sure that loading and off-loading platforms are available. 3. Establishing a Rappel Point. Equal tension between all anchor points on a rappel lane must be established by using primary and secondary anchor points. The rappel rope should not extend if one anchor points fails. 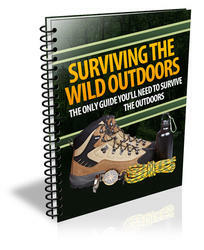 All the rappelling methods discussed here can be performed with a single or double rope. If possible, a double rope application is better for safety purposes. • Double the rope and tie a three-loop bowline around the primary anchor to include the primary anchor inside two loops and enough rope in the third loop to run to the secondary anchor (another three-loop bowline secured with an overhand knot). • Double the rope and tie it around a secure anchor point with a round turn anchor bowline secured with an overhand knot (or any appropriate anchor knot). • Double the rope and establish a self-equalizing anchor system with a three-loop bowline or any other appropriate anchor knot. 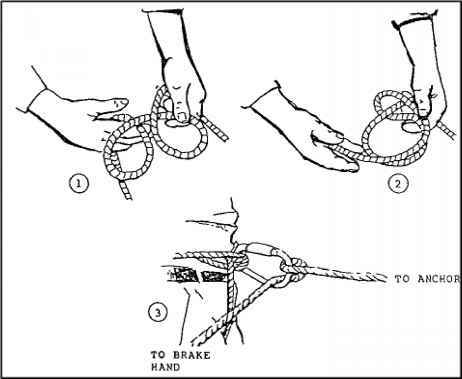 • Double the rope and establish a self-equalizing anchor system (Figure 3-23) with a bowline on a bight or figure eight on a bight. 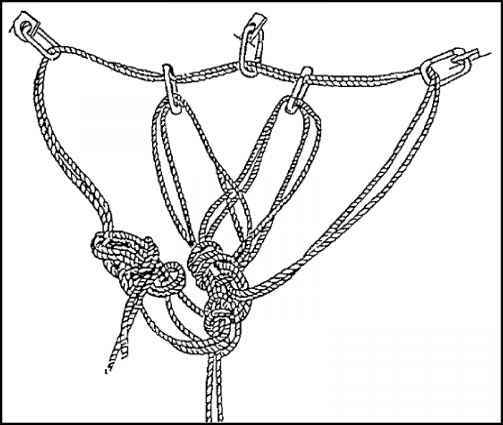 Tie off on the long-standing end with a round turn anchor bowline. FIGURE 3-23. Establishment of a Self-Equalizing Anchor System. • In an emergency, double the rope and place it behind or through a secure anchor point, or tie a runner around an anchor point with a snaplink inserted and place the rope through the snaplink. To preclude a rappeller from sliding off the end of the rappel lane, tie a double figure eight (square knot or double fisherman's knot) at the bottom end of the rope with both ends. • Use two ropes. With both ropes, tie a round turn anchor bowline around a primary anchor point. Take the remaining rope (the tail from the primary anchor bowline) and tie another round turn anchor bowline to a secondary anchor point. The secondary anchor point should be in a direct line behind the primary anchor point. The anchor can be either natural or artificial. The ends of the rappel lane ropes should be offset by 15 cm (6 inches) so that the rope ends feed freely through the rappeller's snaplink. • Use two ropes. Establish a three-piton anchor system using a bowline on a bight (or figure eight on a bight) and tied off on the long-standing end with a round turn anchor bowline (see Figure 3-23). • In an emergency, use two ropes and tie the two ends together with a joining knot. Place the joined ropes behind or through an anchor point, or tie a runner around an anchor point with a snaplink inserted and place the joined rope through the snaplink. The joining knot is offset to the left or right of the anchor. Tie off the bottom end of the rope with a joining knot to prevent a rappeller from sliding off the end of the rappel lane. Tie a sling rope, runner, or another rope around the anchor with a round turn anchor bowline. The rappel rope will have a fixed loop (figure eight or butterfly) tied in one end, which is attached to the round turn around the anchor through the two snaplinks (opposing gates). Tie off a sling rope, runner, or another rope to form a loop. Put the loop through the snaplinks that are attached to the artificial anchor point. Bring the bottom of the loop up and connect it to the snaplinks that are between the artificial anchor points. Grasp the snaplinks that are between the chocks/pitons and pull them down and together. Tie a fixed loop (figure eight or butterfly) in the end of the rappel rope and connect this to the snaplinks that have been pulled together. REMEMBER! Rerouted figure eight knots can be used instead of bowlines. Runners may be used from one or more anchor points. • Double the rope when the rappel is less than half the total length of the rope. Place the rope, with the bight formed by the midpoint, around the primary anchor. Join the tails of the rappel rope and throw the rope over the cliff. Tie a clove hitch around a snaplink, just below the anchor point, with the locking bar inside the snaplink away from the gate opening end and facing uphill. Snap the opposite standing portion into the snaplink. When the rappeller reaches the bottom, he pulls on that portion of the rope to which the snaplink is secured to allow the rope to slide around the anchor point. • When the length of the rappel is greater than half the length of the rope used, join two ropes around the anchor point (double fisherman's knot or square knot). Adjust the joining knot so that it is away from the anchor. Tie a clove hitch around a snaplink just below the anchor point with the locking bar inside the snaplink away from the gate opening end and facing uphill. Snap the opposite standing portion into the snaplink. Upon completion of the rappel, pull the rope to which the snaplink is secured to allow the rope to slide around the anchor point. REMEMBER! When setting up a retrievable rappel, use only a primary point; care is taken in selecting the point. 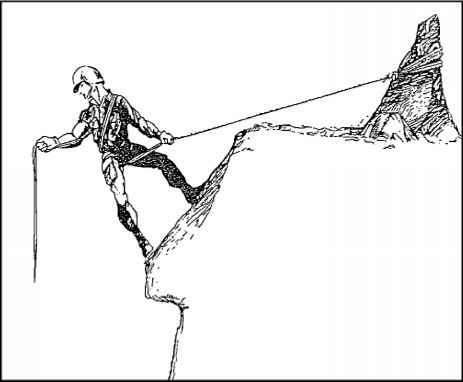 Ensure that a safety line is established when the soldiers approach the rappel point, and only the rappeller need go near the edge. Climbers at the top of a rappel point must be able to communicate with those at the bottom. You should consider using radios, hand signals, and/or rope signals during a tactical rappel. Rappeller I am ready to begin rappelling. I am on belay and you may begin your rappel. I have completed the rappel, cleared the rappel lane, and am off the rope. belayer Rappeller Belayer I am off belay. REMEMBER! In a training environment, the lane number must be understood. During a tactical situation, tugs on the rope may be substituted for the oral commands to maintain noise discipline. The number of tugs used to indicate each of the commands is IAW the unit standing operating procedures (SOP). • Body Rappel. The rappeller faces the anchor point and straddles the rope. He then pulls the rope from behind, and runs it around either hip, diagonally across the chest, and back over the opposite shoulder (Figure 3-24). 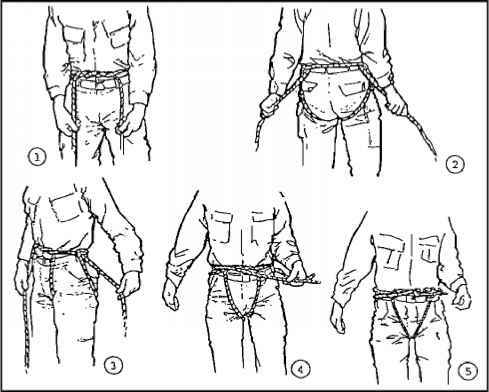 From there, the rope runs to the brake hand, which is on the same side of the hip that the rope crosses-for example, the right hip to the left shoulder to the right hand. The rappeller leads with the brake hand down and faces slightly sideways. The foot corresponding to the brake hand precedes the guide hand at all times. The rappeller keeps the guide hand on the rope above him to guide himself--not to brake himself. He must lean out at a sharp angle to the rock. He keeps his legs spread well apart and relatively straight for lateral stability, and his back straight to reduce friction. The BDU collar is turned up to prevent rope burns on the neck. Gloves are worn, and other clothing may be used to pad the shoulders and buttocks. To brake, the rappeller leans back and faces directly toward the rock area so his feet are horizontal to the ground. • Hasty Rappel. Facing slightly sideways to the anchor, the rappeller places the ropes horizontally across his back (Figure 3-25). The hand nearest to the anchor is his guide hand, and the other is the brake hand. To stop, the rappeller brings his brake hand across in front of his body locking the rope. At the same time, he turns to face up toward the anchor point. This rappel is used only on moderate rock pitches. Its main advantage is that it is easier and faster than the other methods, especially when the rope is wet. Gloves are worn to prevent rope burns. • Seat-Hip Rappel. The seat rappel differs from the body rappel in that the friction is absorbed by a snaplink that is inserted in a sling rope seat and fastened to the rappeller. This method provides a faster and more frictional descent than other methods. Gloves are worn to prevent rope burns. An alternate technique is to insert a second snaplink and run the rope through the second snaplink. Release the tension from the rope by opening the gate of the first snaplink and removing the second. It is easily disengaged from the snaplink. To tie a rappel seat, find the middle of a sling rope and place it on the hip opposite the hand used for braking. Bring one end around the back and to the front of the waist while bringing the other end forward to the front of the waist. Tie a double overhand wrap in front of the body. Bring the ends of the rope between the legs (front to rear), under the buttocks cheeks, and over the rope around the waist to form a half hitch on each side. Bring the ends of the rope to the side opposite the brake hand and tie a square knot secured with overhand knots. Stuff the excess rope into the pocket. Insert the snaplink With the gate down and the opening toward the body (insert it through the single wrap around the waist and through the two ropes that form the double overhand wrap at the front of the waist). Rotate the snaplink one half turn so that the gate opens down and away from the body (Figure 3-26). To hook up for the seat-hip method, stand to one side of the rope. If using a right-hand brake, stand to the left of the rappel rope facing the anchor; if using a left-hand brake, stand to the right of the rappel rope (Figure 3-27). Place the rappel rope(s) into the snaplink; slack is taken between the snaplink and anchor point and wrapped around the shaft of the snaplink and placed into the gate so that a round turn is made around the shaft of the snaplink. Any remaining slack is pulled toward the uphill anchor point. If a single rope is used, repeat this process to place two round turns around the shaft of the snaplink. Face the anchor point and descend using the upper hand as the guide and the lower hand as the brake. This method has minimal friction, and is fast and safe. However, care is taken that the rope is hooked correctly into the snaplink to avoid the gate being opened by the rope. Loose clothing or equipment around the waist may be accidentally pulled into the snaplink and lock (stop) the rappel. For this reason, the rappeller must tuck in his shirt and keep his equipment out of the way during his descent. • Seat-Shoulder Rappel. 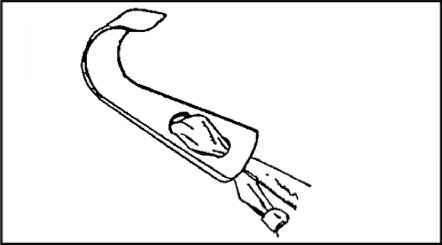 To hook up for the seat-shoulder method, face the rappel point (see Figure 3-28). Snap into the rope that passes up through the snaplink. Bring the rope over one shoulder and back to the opposite hand (left shoulder to right hand). Use the same technique in the descent as in the body rappel. This method is faster than the body rappel, less frictional, and more efficient for climbers with packs and during night operations. • Figure Eight Descender. Attach a locking carabiner to the harness (Figure 3-29). Route the rappel rope up through the large hole and place the bight over the collar. Insert the figure eight with the rappel rope attached into the locking carabiner, and lock down. Brake to the rear and descend as in a seat hip rappel. If heavy loads are to be descended, use a double wrap around the collar. • Munter Hitch. Attach a large radius snaplink to the harness or rappel seat. Tie a Munter hitch and clip into the snaplink (Figure 3-30). Brake to the front and descend with an L-shape body position. REMEMBER! The guide hand should remain on the standing end of the rope to keep the rappeller's head and face away from the hardware. The Munter hitch creates significant rope-to-rope friction and may cause premature wear on nylon ropes. Ensure that the anchors are sound and the knots are properly tied. Ensure that loose rock and debris are cleared from the loading platform. Allow only one man on the loading platform at a time and ensure that the rappel point is run orderly. • Ensure that each man is properly prepared for the particular rappel: gloves on, sleeves down, helmet with chin strap fastened, gear prepared properly, and rappel seat and knots correct, if required. Ensure that the rappeller is hooked up to the rope correctly and is aware of the proper braking position. • Ensure that the proper signals or commands are used. • Dispatch each man down the rope. Select a smooth route for the rope that is clear of sharp rocks. Conduct a self-belay with a Prusik knot tied from yourself to the rappel rope. 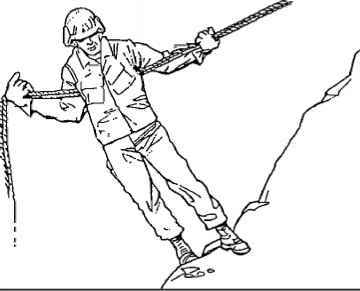 Clear the route, placing loose rocks far enough back on ledges to be out of the way, which the rope may dislodge. Ensure the rope reaches the bottom or is at a place from which additional rappels can be made. 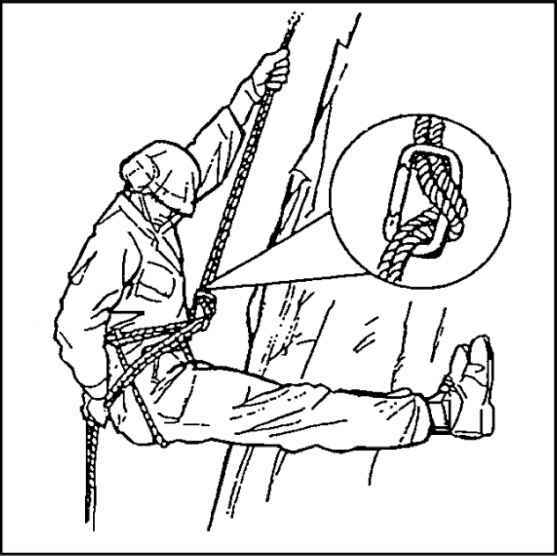 Ensure that the rope will run freely around the rappel point when pulled from below. Clear the rappel lane by straightening all twists and tangles from the ropes. Belay subsequent rappellers down the rope. Take charge of personnel as they arrive at the bottom (off-loading platform). REMEMBER! A rappeller is always belayed from the bottom, except for the first man down. The first man belays himself down the rope by using a safety line attached to his rappel seat that is hooked to the rappel rope with a Prusik knot. As the first man rappels down the rope, he "walks" the Prusik knot down with him. • When the tactical situation permits, each rappeller down must indicate with a shout "Off rappel," and ensures all ropes around their anchors are running free. If silence is needed, a planned signal of pulling the rope is substituted for the voice signal. After the rope is cleared and the rappeller is off rappel, he acts as the belayer for next rappeller. • While rappelling, all rappellers must inspect the ropes as often as possible. • The last rappeller to descend constructs a retrievable rappel point and rappels down. Then, he pulls the rope smoothly to prevent the rising rope end from entangling with the other rope. He stands clear of the falling rope and any rocks that it may dislodge. • Rappellers must wear gloves for all types of rappels to avoid rope burns. • Bounding rappels are discouraged since they stress the anchor, and cause undue wear and friction on the rope. • Rappellers descend in a smooth, controlled manner. The body forms an L-shape with the feet shoulder-width apart, legs straight, and buttocks parallel to the ground. When carrying equipment or additional weight, a modified L-shape is used with the legs slightly lower than the buttocks to compensate for the additional weight. The rappeller's back is straight. He looks over the brake shoulder. The guide hand is extended on the rope with the elbow extended and locked. The rope slides freely through the guide hand. The guide hand is used to adjust equipment and assist balance during descent. 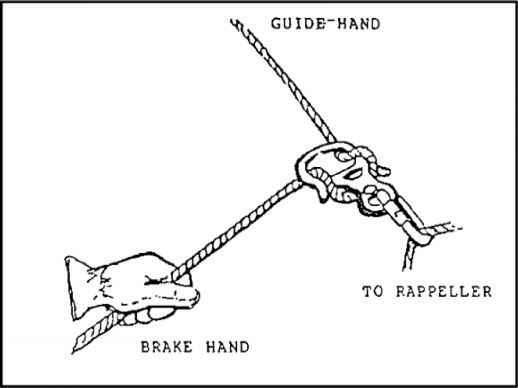 The rappeller grasps the rope firmly with the brake hand and places it in the small of his back (Munter hitch is a front brake). Releasing tension on the rope and moving the brake hand out to his rear at a 45-degree angle regulates the rate of descent. The rappeller never lets go of the ropes with his brake hand until the rappel is complete. • The belayer assumes a position at the base of the lane about one pace away from the rock area. He ensures that the rappel ropes are at least even with the ground during rock and tower rappels. The belayer loosely holds the rappel ropes with both hands so as not to interfere with the fall. If the rappeller shouts, "Falling," or loses control of his brake hand or descent, the belayer immediately stops the rappeller by pulling downward on the rappel ropes. Gloves are not worn by the belayer unless directed. The belayer watches the rappeller at all times and maintains constant voice or visual contact with the rappeller. The belayer wears a helmet to prevent injuries from falling debris. All commands are spoken loudly and clearly. Conclusion. You have now completed the instructional material for Lesson 3. Before you complete the practice exercise for this lesson, you should review the material presented in this lesson. Answers and feedback for the questions in the practice exercise are provided to show you where further study is required. How to tie up a descender? How to run rappel line?